This third work is basically a collection of pieces – composed at the computer and performed wth the sampler – created for different occasions. I dodici frammenti were conceived for the installation “The Rat in the Cage” by the video-artist Liz Saiu, kept at Cittadella dei Musei in Cagliari. On the same occasion Dub and Duo were performed with Daniele Ledda (sampler) and Henning Frimann (self built percussions), while Radio Ambient was created for the concert kept in Quartu Sant’Elena at the Teatro D’Inverno Festival. 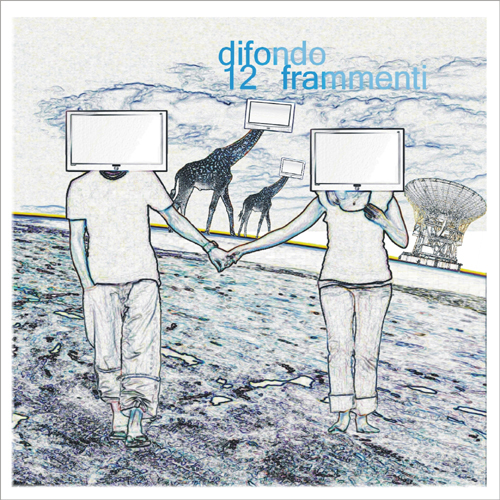 I dodici frammenti aim to offer a personal interpretation of the condition of human modern alienation and take their starting step from a sampling session of tv programmes from the Italian television done in different moments of a single day (29th June 2000). Later these recordings have been gathered on single themes basically centred upon everyday reality, giving particular attention to different types of tv event (news, ads, films, soap operas, talk shows) and to their relationship among them and the specific language used by the media. The twelve tracks are composed following different self imposed rules as: sinthesis – every piece has to be very short, one minute around -; opposition – the text is opposed to the sound body, characterized in antithesis to the sense and the tone of the used language -; onomatopoeia – the music is enriched by an onomatopoietic store as a way of widening the evocative aspect -; variety – besides the general working idea, every piece has to be animated by a specific atmosphere -. On the contrary, the main idea of Dub and Duo is linked with the music field, choosing easily recognisable music genres by means of the usage of traditional rhytmic and singing textures and of chores by strong melodic accents. Radio Ambient is once again connected with the use of radios: either by the effort of creating a soundscape based on the aether sounds or, in the performing moment, through a series of gestures which come from the casualty of the broadcasted radio transmissions during the performing event. Giampaolo Campus: sampler and tv recordings.